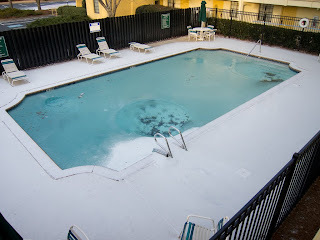 The Traveling Tripod: Heated pool - hmmmm? MARIETTA, GA -- Having a camera in your pocket at all times can be the difference in capturing those fleeting moments of your life. How often have you thought, “If I only had a camera?” In speaking with one of New York’s leading photographers, he attributed his success in street photography to having his camera with him at all times. His camera of choice was his Nikon D2X at the time, with a simple 50 mm. lens. That’s a little too big for me to take everywhere, but the idea is absolutely true none the less. I mentioned recently that I was impressed with the Canon S90, with it’s RAW capture capabilities. Well, I couldn’t resist the temptation any longer, so I laid down the funds for one last week. I’ve only begun using it, and I haven’t had the chance to read the manual yet, but I’m impressed with the initial shots I’m getting. The Canon S90 is the ideal combination of full manual controls with small pocketable form factor. The smallness allows me to carry a slim protective pouch on my belt just about all the time. This was my first stay at a LaQuinta Motel and I was quite happy with the choice. We were looking for the least expensive accommodations as we would be checking in one night and immediately checking out again the next morning. This turned out to be a great selection. For $37 plus tax, (the AAA rate) we got a nice sized room with coffee pot, refrigerator, king size bed and a complimentary breakfast in the morning. Nice people behind the desk made it all that much more memorable.